Working on the streets of the South Bronx and Lower East Side in the early 1980s, I constructed life sized figures from street trash and placed them in highly charged installations. Many of them had brightly painted sheet metal or cardboard masks to cover their heads. This work was widely shown with the Salvatore Ala Gallery in New York and Milan through the 1980s. 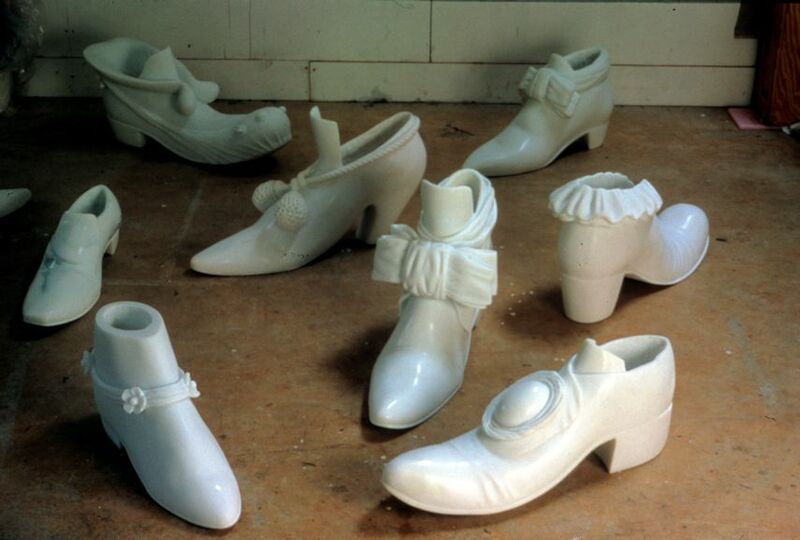 Installations on the street in NYC were done with the Public Art Fund, Inc.
Carved from white marble, these large scale shoes combine 18th and 19th century stylistic elements with contemporary fashions to evoke an ethereal sense of the past. They were carved with a hollow, and were single. In all i carved about 24 of these shoes, and most of them are owned by private collectors. A series of funerary containers, ash houses are resting places and dispersal means for human remains and ashes. Studies, proposals, and some finished works, all figures in a wide variety of materials: plaster, wax, ceramic , plastic, and bronze, all under 15" tall. ​Newspaper Children had is origin in my MFA thesis show at Mass Art in Boston in 1982. Created as a series of installations that featured small 3 foot high figures made of loosely wrapped newspaper intently ‘playing’ on furniture, with chalklines and stones. The work was shown in venues in the USA (Bemis Foundation, Ala Gallery, NYC), England (Leeds City Gallery, Watermans Art Center, London), Scotland (Third Eye Center, Glasgow)and Hong Kong (CCDC). A series of carvings in wood with references to screens, diagrams, and organic growth forms.